On August 10th 2012 Suburban Menace will be launching their debut music video, with an official launch party at Trinity nightclub in Greenpoint, Cape Town. On the night, Suburban Menace and Mobcow Entertainment will be joined on stage by critically acclaimed and internationally renowned “Joe Barber “. The duo of Oscar Petersen & David Isaacs will be incorporating their live act into the performance set by Suburban Menace. Definitely something that’s going to be different as well as exciting. Entertainment will also be supplied by prominent Cape Town DJ’s, choreographed dancers, supporting acts like Baza Lo, Principlez and Ben Ceaser, an audio visual set as well as live competitions in and around the launch venue. Parallel to the video launch, the re-launch of their local entertainment website themenace.co.za will also occur as well as the official release of their latest mixtape “The Menacing Mixtape Volume III “. 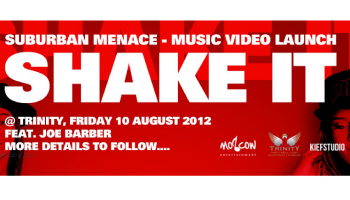 Pre-sold tickets will be available at select locations in the Northern Suburbs and in other areas on request (locations on www.themenace.co.za and facebook.com/suburbanmenace). Prices for the early bird tickets will be R65 general and R100 for VIP. Ticket prices at the door on the night will be R80 general and R120 VIP. Free tickets to be won prior to the launch, as well as 50 free mixtapes to the first 50 people that arrives on the night. A percentage of the tickets sales will be donated to a charity involved in the expansion and growth of the arts & entertainment in the Western Cape.